DETAILS: Enjoy a “Trip Around the Sun” during your stay at 53 Sunfish Street! On the first floor are three rooms offering guests a variety of sleeping arrangements. The spacious first-floor master bedroom features a king bed and private bathroom with a shower. Younger guests will adore the bunk room, which boasts two queen-over-queen built-in bunk beds and one twin-over-twin bunk bed. One set of queen-over-queen built-in bunks await in the bunk nook, and all guests in these bunk areas will enjoy the mounted flat-screen television in each bunk and a shared bathroom with a glass-front shower and a dual-sink vanity. In the game room, a pool table, foosball table, and multiple mounted flat-screen televisions promise endless entertainment. The crown jewel of this home is the exquisite outdoor oasis, which features a large private pool (which can be heated year round for an additional fee) and a swim-up bar, ample pool deck chaise lounge chairs, a well-equipped outdoor kitchen, and a large outdoor flat-screen television. The home’s second floor presents a spacious, open floorplan on the main living level. Elegant coastal décor and gorgeous hardwood floors create a tranquil atmosphere, and transom windows surrounding the room allow natural light to brighten the space. The large kitchen is a home cook’s dream and features bright white custom cabinetry, premium stainless steel appliances—including two dishwashers—and a top-of-the-line gas range. An oversized dining table and the nearby breakfast bar offer ample seating for enjoying family meals. Sink into the leather sofas, and relax in front of the large flat-screen television or enjoy the stunning outdoor view. Pocket sliding glass doors lead to the spacious and well-furnished second-floor balcony. Also on this floor are two stunning king bed guestrooms, each offering light-filled transom windows and a private en suite bathroom with a shower. On the third floor is an additional living area with a flat-screen television and luxurious seating, and three incredible bedrooms are found just down the hall. The first master bedroom offers a king bed, access to the balcony, and a private en suite bathroom with a shower, a spa tub, and a dual-sink vanity. The second master bedroom boasts a king bed, balcony access, and a private en suite bathroom with a shower. A plush king bed and one twin-over-twin bunk bed await in the guestroom, and guests here can enjoy a private bathroom with a shower and a tub. The spacious third-floor balcony offers ample seating and a wonderful place to unwind. What a beautiful house! We stayed with 5 families (10 adults, 9 kids) at 53 Sunfish & had a blast. The pool & hot tub was definitely the highlight for the kids. We did have a quick tutorial on how to keep the pool heated & work the outside TV. Every technical issue or household problem we encountered was addressed very promptly after calling or messaging the team. We only had a few issues with internet, outdoor tv, plugged toilets and too many hairdryers going at once blowing the fuse. The outdoor grill was a huge hit for the grill masters amongst us & the kitchen stove was perfect for making eggs & bacon for such a large group. We only found 1 small cutting board, but oh well. We loved having the beach a few minute walk away. We rented the beach chairs, umbrellas & cooler through 360 & they were there upon our arrival. Wish the house included these items, but at least we didn’t have to buy them or rent through the beach club, which would have been too expensive for our large group. Exceeded our expectations. Except for the alarm on the ground level door. We are thrilled the home was beyond your expectations! While sometimes bothersome, the pool alarms are required in the state of Florida in rental homes with pools. We are glad it didn't hinder your vacation though! Thank you so much for staying with 360 Blue and be sure to come back again soon! Great house and plenty of room for all of our family! Great location to the beach and shops etc. Loved the outdoor area and the pool was amazing! We would definitely stay here again! Thank you for choosing to stay with 360 Blue! We are beyond happy that you had such a great stay! The outdoor area and pool are beautiful and great to relax and take a dip in! We hope to have you back at the beach again soon! With 18 our immediate family attending we found the "Trip" to be awesomely welcoming. It is such a well equipped and thought out property that all of us ranging from 8 months to 60 were quite comfortable and easily entertained. Pool area is wonderful for all ages! We encourage larger family's to consider the property as the very close to beach location made the schlep as easy as it could have been being across old 98 and thru the Cabana Club access less than 75 yards or so away. Supermarkets, shopping, restaurants all were nearby and of varying types you may want or need. We are so glad that you enjoyed your vacation with us in Destin! We agree that this home is an incredible option for larger groups looking for a fun and relaxing beach getaway! The pool at 53 Sunfish is always a crowd pleaser and the home is located perfectly to make your vacation an easy one. We look forward to seeing you again very soon! Our family of 14 had a fabulous vacation and this house is very nice. The pool and outdoor area surpassed our expectations. The pool is huge and well designed. Was worried about the location being across the street from the beach, but it was not far at all. A short walk across the street and the gate with private beach entrance is right there. However, the code didn’t work. We had to walk about 10 feet around to the sea oats hotel to get to the board walk, it was simple. Rich got us umbrellas and chairs with no one in front of us on the beach. The 6 seater golf cart wAs also a huge plus! The house is spacious and clean, comfortable. We plan to stay here again and I would rate it 5 stars. There were a couple of things that could improve like the dryer on 3rd floor didn’t work well at all. Had to dry towels 3 times. And the chairs in the living room need back cushions (they were missing). And the blinds in the 3rd floor guest room were not long enough to cover the whole window. Overall, it’s Fabulous!!!!!!!!!!! We are so glad that you enjoyed your vacation with us in Destin! We agree that this home, especially the pool area, is amazing! We will share your feedback with our team in regards to the dryer, living room chairs and blinds in an effort to correct this for future guests. We hope to host you and your group again soon! We are so thrilled to hear how wonderful your vacation, as well as your experience with 360 Blue, was! We look forward to being able to host you and your group again very soon! Our group of 24 had an amazing week at Trip Around the Sun! The house was beautiful and spacious. At no point did we feel crowded or in one another’s ‘space’. Some of the great amenities were the 2 dishwashers, 2 indoor refrigerators, the Viking griddle, 2 sets of washers and dryers, the golf cart and 8 bikes. After a long day at the beach we took advantage of the outdoor entertainment area, equipped with a huge grill, fridge, ice maker, Sono sound system, big screen TV, an over-the-top pool and hot tub! The list goes on and on..... We will definitely look into other 360Blue properties the next time we visit the Destin area. I personally loved their Hospitality app. The app allows you access to everything you need to help plan your trip. From concierge services, access codes, to addressing any issues during your stay. You even check-in and check-out with a push of a button! If you’re looking to spoil yourself and your family, you won’t be disappointed with The Trip Around the Sun! Sounds like everyone really found something to love in this amazing home. It really is the perfect place for a family to get away for a relaxing beach vacation. We loved having you with us and we hope to see you back soon! Fantastic! Everything our family needed. Great pool. Loved the Sonos Sound system. Lots of private spaces even though every room was occupied. What a beautiful sunset! We are beyond thrilled that you enjoyed your stay in this amazing home. We hope to see you back soon for another beach getaway! The property and location were outstanding! Everything was clean and high end ( two dishwashers, Viking stove inside and grill outside, 3 refrigerators...). The inside was updated and beautifully decorated. However, the outside was our favorite! Whether you were enjoying time on one of the five patios or sitting outside by the pool there was plenty of space to enjoy the beautiful sun! In addition, there was easy access to the beach and a great running and biking path(which we utilized everyday). We loved having 8 bikes at the house for our use! It was close to several grocery stores, shopping locations, as well as many great dinning options. Check out the Beach Walk Cafe for a fabulous meal! 360 Blue made our check in process and all details regarding our stay extremely easy! They were very attentive to handling an issue with the pool and 2 TV’s. My only complaint would be that the lounge chair cushions were ripped and need to be replaced. We hope to return! We are thrilled that you enjoyed this outstanding home and the location! And very glad that you found it to be clean! The high end appliances and beautiful décor on the inside are amazing, we agree. With the spacious patios, pool, and plenty of places to get sun, the outside cannot be beat either! There is something for everyone here whether you want to bike or run along the path, or hang out on the beach. It is all easily accessible, and having the bikes at the house makes all the shopping and restaurants that much more convenient! 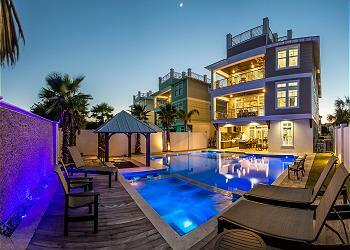 This location is second to none when wanting the perfect Destin vacation. Thank you so much for the compliment on our customer service…it is our pleasure to help make your vacation seamless and easy! We appreciate the feedback on the lounge chair cushions and will absolutely be assessing this. Please come back and see us soon! Thanks again for the review! Our group of 18 had a wonderful time despite unseasonably cold weather. The size and layout of the home enabled us to gather when we wanted or to get some quiet time to read or rest. We are so happy to hear your large group had such a wonderful winter getaway! We loved having you with us and hope to see you back soon! All in all, it’s a great house in a great location. We had 10 people and it worked well as everyone had their own space. Easy walk to the beach and was a great experience overall. We did have problems with the dryers not working properly, one of the kitchen ovens didn’t work properly and it was not the cleanest upon arrival. Nothing terribly out of shape but your feet would turn grimy when walking barefooted around the house. The maintenance people were great fixing anything that was able to be fixed and responding to our requests. Additionally, everything we asked prior to arrival was taken care of. I would definitely use this company again to rent a home and would enjoy staying in that Home again with the minor fixes/cleaning being done. What a beautiful view! Thank you for your valuable feedback. We are happy to report that the dryers and oven have been repaired. We are consistently working with our housekeeping team to ensure the house is up to our standards. We hope your family made some amazing memories during your time at the beach and we hope to see you back soon! Superb experience with a private entrance to the beach. The property has nearly every amenity one could imagine, all the way from a large professional kitchen to a golf cart. The place was clean, well appointed with many options for food, groceries, and shopping nearby. The entrance from the house to the pool has an alarm to notify you if someone walks outside unattended. In other words, it is very safe if you have young kids. The management company provides step by step instructions for gaining entrance to the property along with tips for "working" all the features in the home. We arrived very late, but we had no issues because of 360 Blue's fine management tool that allowed us to access instructions via a private phone "app." The floor plan is ingeniously laid-out and easily accommodates 28 adults. Thanks again for a great experience. What a beautiful photo! We are thrilled to hear that you enjoyed the property and your stay with us so thoroughly! We're glad to hear you could take advantage of the complimentary golf cart and use of our easy 360 Blue app! Thank you so much for choosing 360 Blue for your beach getaway and for taking a moment to share your experience with us. Be sure to come visit again soon! We are so pleased to hear that you enjoyed your stay with us in Destin! Thank you so much for choosing 360 Blue and for taking a moment to share your experience with us! Be sure to come back and visit us again soon! We love seeing those smiling faces! We are thrilled you had such a wonderful vacation in Destin! This home truly is beautiful and we are so happy you enjoyed it so much. Thank you so much for staying with 360 Blue and we hope to have you back again soon! We had an absolute blast!! The house is beautiful with so many nice features (especially the elevator for luggage and treks up to the third floor)! We loved the back patio and pool area the most! The beach access was easy and very convenient once we figured out where it was. We had a party of eight so we never felt on top of one another. We hope to stay with you again another time! This is such a beautiful photo! You truly captured the beautiful emerald color of our beaches! 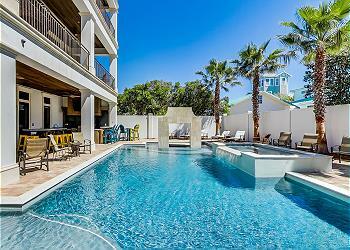 We're pleased to hear that you enjoyed your stay with us in Destin so much, and could take advantage of making memories on the back patio and in the pool! Thank you so much for choosing 360 Blue for your beach vacation. Come back and see us again soon! We loved the house! We were a last minute rental and it could not have worked out any better. The house was the perfect size for our family. The location to the beach was ideal. Being able to walk across the street to the private beach entrance made it very convenient to run back and forth between the beach and the house. The pool size also was great for both the kids and adults. There were some minor items that needed fixing in the house and 360 blue management team promptly responded to the requests. We are all of our meals except one at the house and utilized the indoor and outdoor kitchen. I would rent this house again. What a beautiful photo! We are so pleased to hear that you enjoyed the property so thoroughly and that our team was able to provide you with great service! We're happy to hear that you could take advantage of the private beach access, it really makes trips back and forth easy! Thank you so much for choosing 360 Blue for your getaway, we hope you'll be back to see us soon! The house is beautiful and the views were just what we wanted. Thank you for choosing to stay with 360 Blue! We are so glad you and your party had such a great stay. Be sure to come back and visit us again soon! We visited 53 Sunfish with family. My wife and kids (12 yr old twin boys) loved everything about this house! First, the size blew me away, it never seems to end. The downstairs level is probably my favorite with the huge pool, outdoor kitchen, and the game room which opens up to the pool, not to mention all of the beds. Up one level is the HUGE kitchen, dining area, and living room where the attention to detail is impressive. The ceilings are a beautiful wood with recessed lighting and speakers handpainted to match the wood grain. There’s enough room for many cooks in the kitchen! The bedrooms and bathrooms are all really nicely finished out. There’s also a rooftop deck are to watch some amazing sunsets. This place would be great for a family reunion, or for several families with children of any age. I would absolutely book this house! Our trip to Destin was all around great, but having a chance to stay at the 53 Sunfish home itself made the visit all the more memorable. Not only was the home extremely spacious but the attention to detail was unlike anything I have ever seen. Having the beautiful pool and massive kitchen and cooking areas in and outside of the home were great and made it unbelievably easy to accommodate a lot of guests without the stress of feeling over crowded. In addition, the views from all of the patios were great, but especially the rooftop view which made for a great spot to watch the sunsets in the evening. Being so close to the beach with a private beach access was a great feature, considering we were literally directly across the street which made traveling to and from the beach extremely convenient and hassle free. Lastly, the 360 Blue staff was more than accommodating to any of our needs and they provided the highest quality of service, not to mention their app was extremely user friendly and helpful. I would absolutely book this house again, without hesitation, because not only was the house remarkable but combined with the great management team and service we experience, it makes for a truly remarkable and unique experience. I had the pleasure of staying at 53 Sunfish and I have never stayed at a house quite like this one. It truly has 360 degree view from the top deck, with no obstructions to diminish the optics. We saw 5 ospreys performing formations right above us as well as many f-35s and other aircraft from the base in Destin. The beach is right across the street and it was nearly empty, unlike the more crowded in the area where an empty patch of sand is hard to find. The outdoor grill area was in use nightly, along with the swim up bar area and the salt-water pool. Three separate patios were available to our group and we used them all at one point or another. The kitchen was spacious enough to fit all of our guests and we had more than enough cutlery, pots and pans than would be needed to cook for an army. All of the finishes were unique and every day I was noticing new design features that I had overlooked previously. Usually, when I vacation at the beach I hardly spend any time at the house, but 53 sunfish was so spectacular that I was drawn to the house at the end of each day on the beach to see what else it had to offer. The management staff was responsive when we had a tech issue and our extended family will certainly be booking this house again next time we do a family reunion in Destin! Thank you for staying with 360 Blue and we couldn't be more happy you enjoyed your stay in Destin so much! We hope to have you back again soon!